I love cake... .and this tastes like cake. Brilliant. A warming gigantic bowl of carrot cakey cinnamony oatmeal...The only thing certain to get me out of bed of late, and hands down the best way to start a chilly day. I have been having this awesome oatmeal combo religiously for the past few days. The playas in the Breakfast mix are : 1/2 cup gluten free buckwheat oats, one grated carrot, raisins chopped walnuts, cinnamon, all spice, applesauce, a dash of soya milk and a little sweetener. Lunches have been mostley open face sammiches... here is a beet, turkey mayo numbah, with GF pretzels and always with a side of spinach and glugs of balsamic vinegar. For afters I had a slice of my skinny spiced carrot cake bar with a cuppa English tea. On Sunday, I went shopping with Harry to London's Brent cross shopping centre to spend some money we dont have, as soon as we parked up in the shopping mall car park our tummies were rumbling so we headed to our favourite, Wagamama. I wanted to try something different, (variety is the spice of life my friends) I went for the chicken Donburi rice bowl, Made Gluten Free... and taste free, it arrived after a very long wait and was plain rice, plain chicken and a whole grated carrot, I was a little disappointed but still devoured it. Mr bake and beebz know what he likes and had his staple Chilli Raman... he like things hot hot hot. If you have been to wagas... what dishes would you recommend? spent what seemed like hours at the mac counter trying to find a new lippy... but nothing was purchased. After coming away empty handed and a Little sadden, I suddenly spotted FRO YO, YO! sprinted over and after a little taste testing plumped for pomegranate with fresh raspburries and yogurt covered dried fruit toppings. When ever I see a frozen yogurt vendor i go excitedly bizurk, harry will testify this. On a trip to St. Albans market to get the weekly fresh fruit and veg, to supply my huge demands me and my mum got this basil mozzarella from one of those little the stinky cheese stalls. so supper was a mini basil mozza toast pizza... pesto, toms and onion topped with what looks like snot... but its not. om nom nom. To round off dinner I had another slice of my cake. so much carrot up in this post, man. In the evening I got in a Gym session... started of with some 20 minute elliptical, 10 minute treadmill burst and cool down for 10 minz on the stationary bike. followed by a weighty strength workout. FEELING DA BURN. totally pooped me out! AAAAAHHHnd this other big monster... this bad boy was hiding in my bed, under my pillow... Im not affraid of spiders in the least but no kidding he's the size of my fricken face, tried to catch him, but he got away and im not sure which direction... he'll be back. How many spiders is it they say you eat in your sleep? oh dear ain't gonna sleep well tonight. Autumns has most definitely arrived, the airs crisp and its getting crunchy under foot, its time to put away my denim cut off shorts ( That certainly haven't seen much of a summer) to the back of my wardrobe once more, pull on a bit of knitwear and cosy up with cinnamon, blankets and hot cocoas.... and this ridiculously delicious and unbelievable healthy spiced carrot cake. Nothing goes better with carrot cake than rich creamy frosting, I lightened it all up and I used Alpro soya yohurt in stead of full fat cream cheese and it worked incrediably well. I was sent some coupons by the people Alpro to try out some of there products. oh my, from my first spoonful of this soya yoghurt I was hooked! I absolutely adore it, its thick and creamy and revolutionized my breakfast! 1tsp xanthum gum1tsp gluten free baking powder. 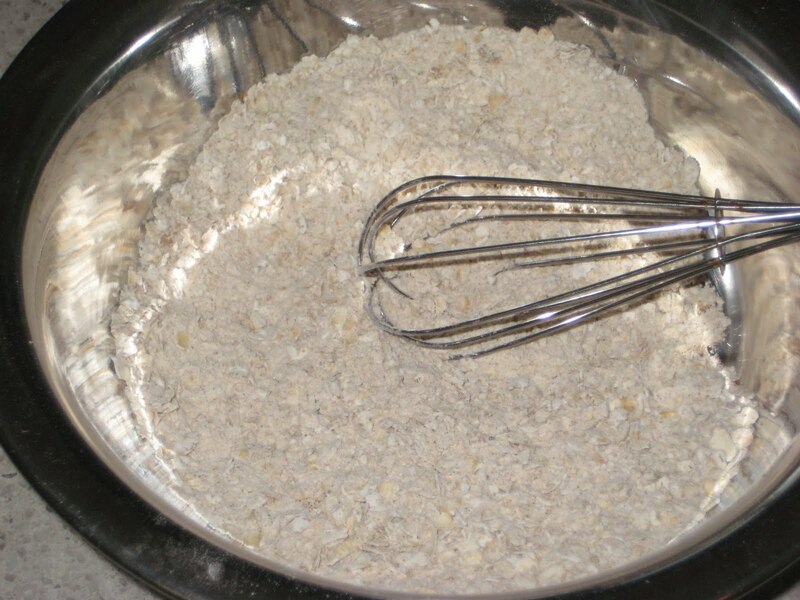 In a large mixing bowl add sugars, egg and applesauce, mix and thoroughly whisk up a until light an fluffy. stir in grated carrot, ginger pieces, raisins and walnuts. sift flour, gum, baking powder and spices and cinnamon. spoon mixture in to a baking tin and smooth down. Bake at 180 degrees for 30 minutes. Add gum and choice of sweetener to soya yogurt and thoroughly mix it together until it thickens, spread on to one bar and top with another slice of cake. for a finishing touch, drizzle with icing. Disclaimer: sorry guys this is a very pooch filled post. actually, sorry im not sorry, I LOVE THEM DAGS! ... well only really one in particular. Ive been outta the loop with W.I.A.W for the past few weeks as work has seemingly taken over my blogging life, but hopefully tis will all change soon and ill find a routine that works for me. So first off...What i wore Wednesday! my Bargain thrift Hobbs dog knit jumper, purchased this weekend, Topshop skinny jeans and my new glasses. a very Sensible teaching outfit... can't be wearing my usual ultra cropped tees on school days. After all that faffing around photographing my outfit and getting Beebz to be still, breakfast was rushed, no time for a hot one just a Gluten free cereal mix in a giant bowl with bloobs, strawbs, half a nana, soya milk and topped off with lashings of cinnamon and a sprinkle of coconut. Whilst on tea break, I perused the pages of the latest gossip mags and came across the fashion page...my knit wear is apparently on trend. and whilst patting myself on my back I ate the last of my dog shaped Gluten Free shortbread cookies! By lunch time, the kids have completely worn me out and I'm usually pooped and going blind with hunger. after the walk home, prepared and waiting for me was my jar of cookie crack inspired by chocolate covered katie. I have been eating this healthy and very addictive cookie dough dip by the spoonful lately. Its just the batter of my blondies uncooked ;) it doesn't look impressive but oh geeeeeez its the beez kneez. soooo...Lunch was 2 slices of GF toasted bread with cookie dough and a drizzle of honey, along with a apple from my garden chopped up and sprinkled with honey. Spiced butternut squash and carrot soup with hummus and rice crackers. Beetroot and Lentil Bhajis with a corriander dip. After my lunch, we climbed in my Dad's car and headed out to dunstable downs for a long walk on the hills, It was so unbelieveably windy, I had an instant headache from the cold relentless blustery winds, we had to retreat to some woodland. Once back at home, I warmed up with a cup of english tea. I did a quick home cross trainer workout which worked up a appetite for Supper... A salad niscose sorta thing, boiled egg, tuna, spinach, tomatoes, beets and heeeeaps of balsamic vinegar. Eating some popcorn whilst i type, planning on an early night, gotta be bright eyed and bushy tailed to educate some kids tomorrow. PEACE OUT. oh and thanks for Jenn for hosting as always!!! oh my mutt munchies...Simple Gluten free shortbread made a bit exciting with the aid of a cookie cutter! Pre heat oven to 200*C and line a baking tray with grease proof paper. In a bowl mix together flours, gum and sugar. press in cookie cutter and carefully lift shapes onto prepared tray. remove from oven and cool on tray, then very carefully place each biscuit onto a cooling rack. decorate with extra icing if desired. This recipe is brilliant as a basis biscuit recipe, but I think its the decoration that makes them! Pups choc chipped and ready to be popped into the oven. ...OH too late his lower half is already in my tummy and I don't think we can save him. WOOF! These are so good! simply sweet and buttery. Get barking baking now! This post come from my bed, where I'm recovering from a fun night out with my girl, Charlotte. There was Jagerbombs and alot of stumbling. SIP SIP. Gonna bake off this head ache and down/chug a super smoothie, see you soon. ohhhh what to do with my bumper crop of berries!!?! There were so many recipes these juicy sweet berries would've made special, but recently I have been finding myself needing a portable yummy snack for my break times in the school staff room. Whilst All my colleages dunk their biscuits in the tea and coffees after a testing morning of educating little'uns, I sit there nibbling my fruit ( not that fruits bad! fruits good for you kids, eat it!) ... but treats just satisfy that 11o'clock sweet tooth snack attack sooo much more. And in any case this is a muffin that healthy and jam packed full to the brim with goodness. Made from soya yoghurt instead of any fat these muffins are moist and packed full of a deliously sweet berry flavour, whole blackberries and chunks of cooking apple add texture and an extra tart hit in every bite. 2. Line muffin tins with cupcake liners. 3. 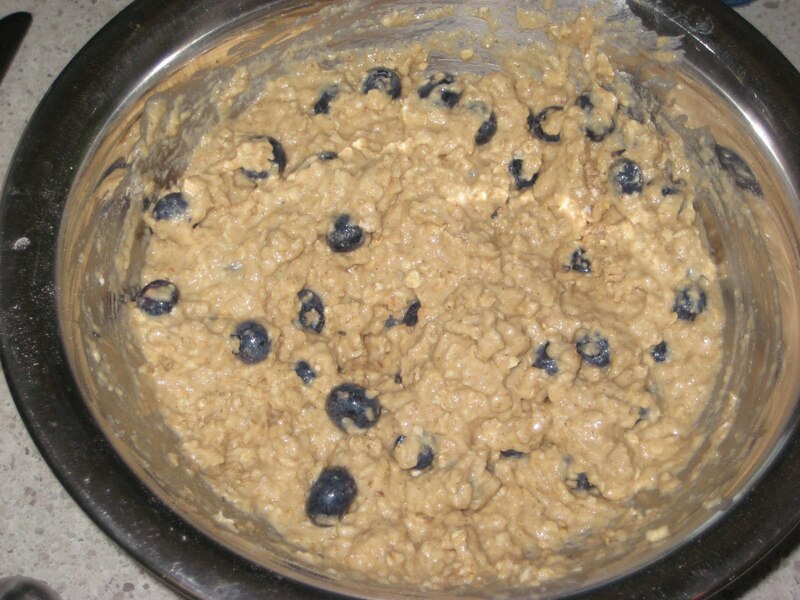 In a large bowl, combine the dry ingredients... flour, oats, baking powder, baking soda, salt, and cinnamon. Set aside. 4. 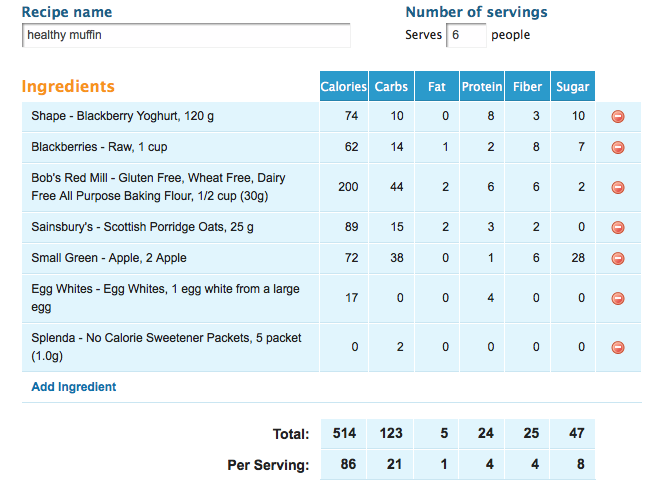 In another bowl, combine the following ingredients... pureed apple, Alpro yogurt pot, sweetener, vanilla extract, and egg. 5. Now add the wet ingredients to the dry and fold the mixture. DO NOT OVERMIX. 6. Add the berries and chuncks of apple and fold gently. 7. Spoon the batter into the cupcake liners. 8. Place the muffins in the oven for 16-18 minutes. Easter Chocolate Cornflake egg nests! Gluten Freeeeee. Cherry coconut Vanilla (protein packed) cake! Gluten Free.